Printable Maths game for learning number facts - numbers which add up to ten. It’s a race to find the correct numbered squares to make each of the number sums true. 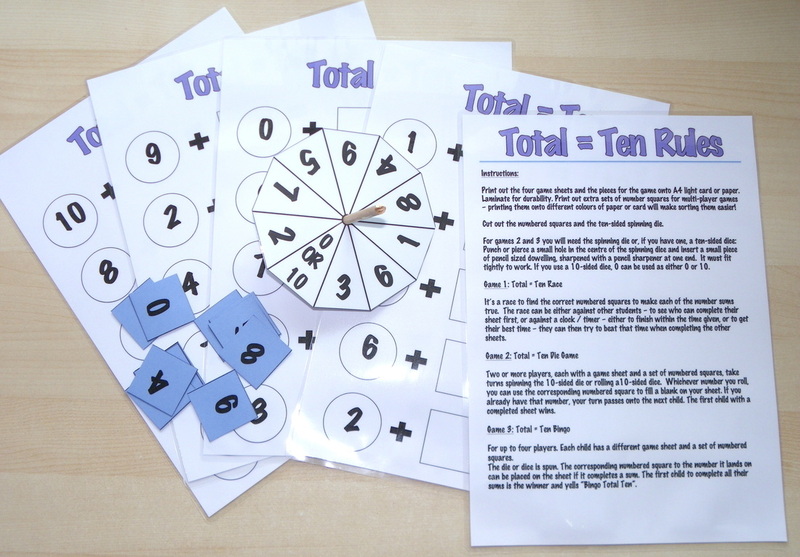 The race can be either against other students – to see who can complete their sheet first, or against a clock / timer – either to finish within the time given, or to get their best time – they can then try to beat that time when completing the other sheets. Two or more players, each with a game sheet and a set of numbered squares, take turns spinning the 10-sided die or rolling a10-sided dice. 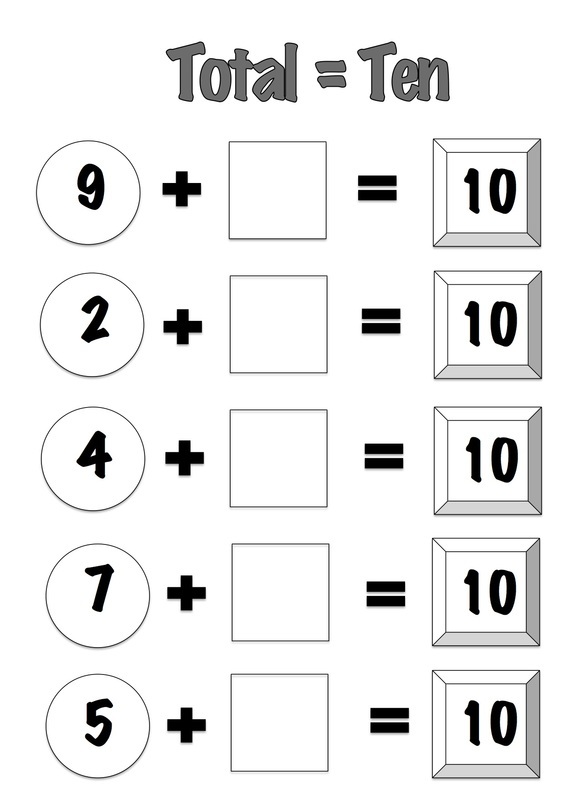 Whichever number you roll, you can use the corresponding numbered square to fill a blank on your sheet. If you already have that number, your turn passes onto the next child. The first child with a completed sheet wins. For up to four players. Each child has a different game sheet and a set of numbered squares. The die or dice is spun. 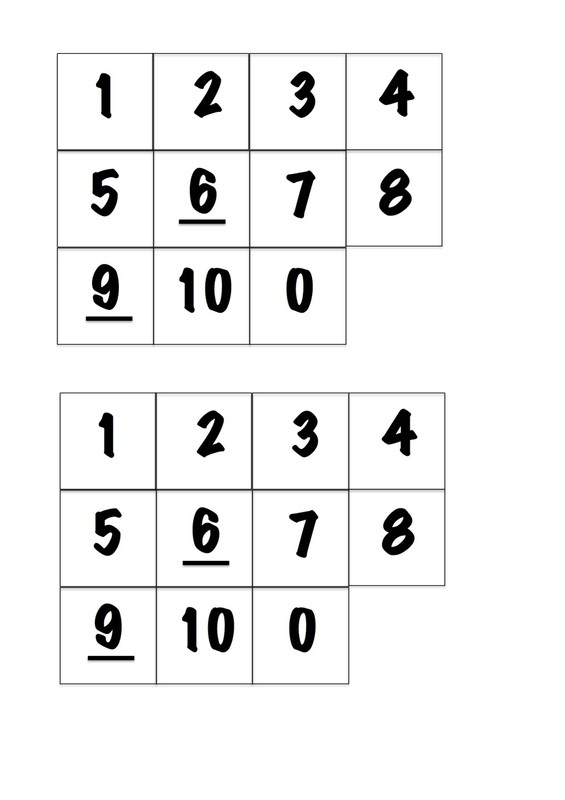 The corresponding numbered square to the number it lands on can be placed on the sheet if it completes a sum. The first child to complete all their sums is the winner and yells “Bingo Total Ten”. 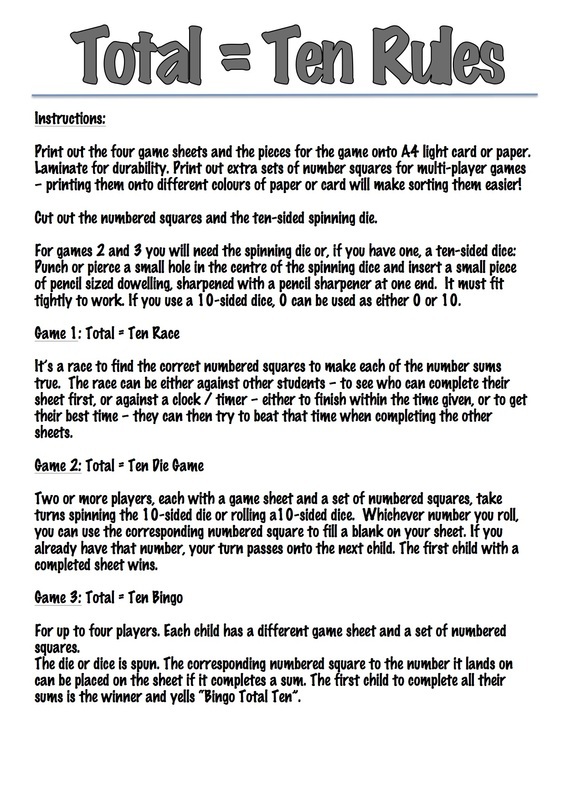 Print out The four game sheets and The pieces for the game onto A4 light card or paper. 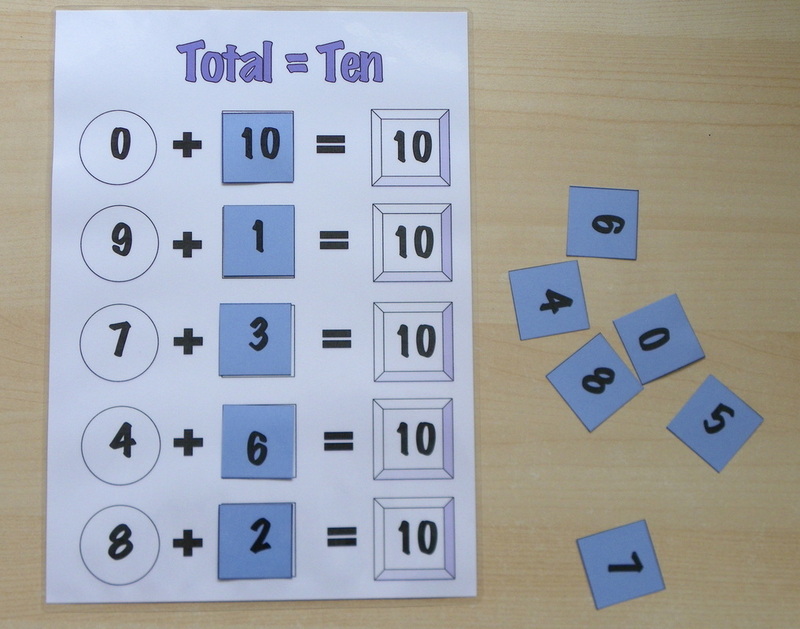 Print out extra sets of number squares for multi-player games – printing them onto different colours of paper or card will make sorting them easier! Print out the rules and instructions. 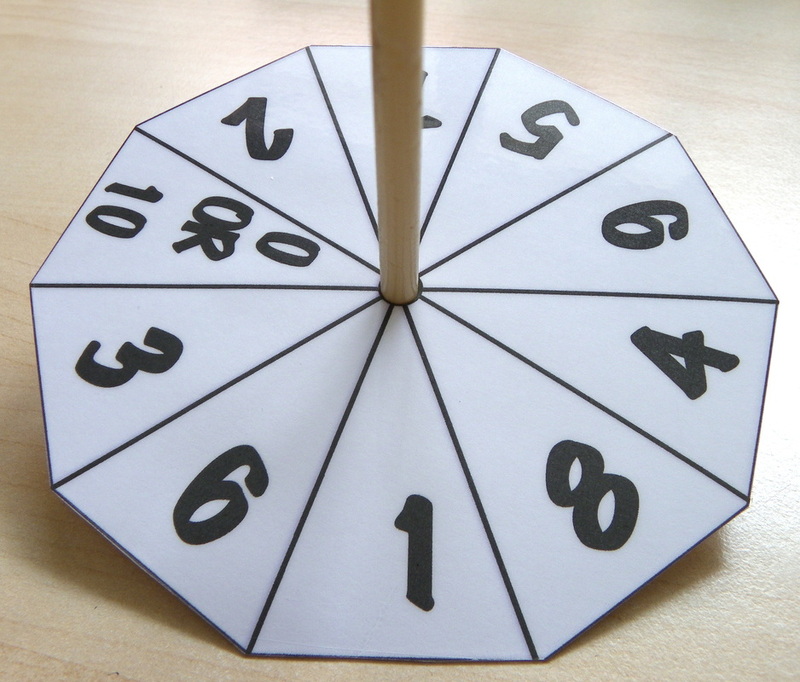 Cut out the numbered squares and the ten-sided spinning die. If you use a 10-sided dice, 0 can be used as either 0 or 10. To make the spinning die: Punch or pierce a small hole in the centre of the spinning dice and insert a small piece of pencil sized dowelling, sharpened with a pencil sharpener at one end. It must fit tightly to work. If you prefer you can make a different die, click here for instructions on making a flick die. 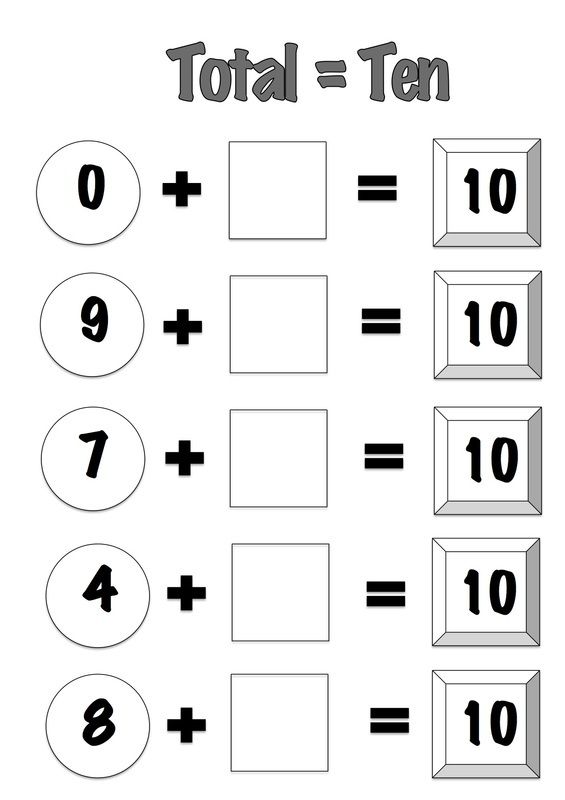 Print out the die for numbers 0 to 10. Right-click on the jpg images (right and below) and save them to your computer. Print the from there. Open the pdf doc's below and select print.